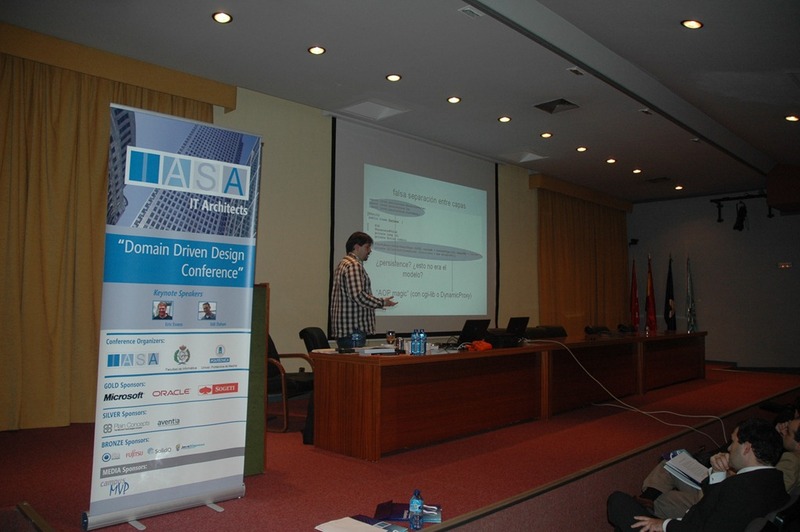 It was a remarkable DDD (Domain Driven Design) event in Madrid, Spain. We got around 150 attendees! !, and taking into account that this is the inaugural event from the IASA-Spain association, and this association was almost unknown in Spain, until now, it is something I must highlight. Of course, having the keynotes delivered by Eric Evans and Udi Dahan was fundamental for achieving that. Most attendees gave such a good feedback about the sessions and specifically about the IASA-Spain initiative because we were talking about Architecture, Design, DDD, patterns, etc., no matter what technology you work with. In fact, there were sessions and attendees used to work on .NET platform but also sessions and people used to work on Java platform. Even the sponsors were companies very heterogeneous, like: Microsoft & Oracle, or Microsoft partners, and JavaHispano.com, etc. That is good for open debates about design and architecture and also for technology interoperability and especially to learn from each other experiences. Here I post some data and pictures about the Conference. Alfredo Casado during his session about ‘Implementing DDD Patterns on Java Platform’, using Hibernate and Spring. Final picture (the day after the Workshops, Nov. 8th) with some speakers and several collaborators. Starting from the right: Diego Vega (Program Manager from the Entity Framework Product Group, Microsoft Corp), Eric Evans, Udi Dahan, Javier Calvarro (Microsoft Developer), Myself (César de la Torre, Microsoft), Unai Zorrilla (Plain Concepts) and Pierre Millet (Microsoft Consulting Services). Tomorrow (Nov. 10th) we’ll deliver the last WORKSHOP, a DDD WORKSHOP by Eric Evans. I’ll probably update this post with some info about tomorrow. It’s been a great experience, and I really appreciate Eric Evans, Udi Dahan and Diego Vega coming to Madrid and helping us to deliver such a great event-sessions and Workshops.We really enjoyed all this week with them and all the attendees, of course!.